One of the things I’ve realized as I’ve made the switch to all non-toxic and homemade cleaners over the past few years is that it’s important to be organized in order to minimize the effort it takes to make your homemade cleaners, and maximize the likelihood that you will have your cleaners made and ready to go, right when you need them. Between the ingredients needed to make your cleaners, the empty containers to make them in, keeping the recipes handy, storing the cleaners once you have them made, and the wipes and rags you use instead of paper towels, there are a lot of different parts to homemade cleaners to keep organized and easily accessible. I’ll be honest though that I’ve let my homemade cleaning supplies get a little disorganized and out of hand. But, I’m planning to work on that over the next few weeks and I’ll share my “after” pictures with you and tell you about how I whipped my homemade cleaning system back into shape next month. Many of the ingredients you need to make homemade cleaners are multipurpose and work for several different cleaning recipes, so you want to make sure you buy them in bulk which will ensure that you always have enough on hand, and will also help to save you money. I buy the biggest jugs of vinegar, boxes of baking soda, and containers of Castile soap that I can and stock up when they are on sale. Store your ingredients where you need them. But, then you need to store those ingredients in an accessible place to keep making your cleaners as easy as possible. I plan to do this in two ways. I usually buy multiples of most of my ingredients and store the extras in the basement. Instead, I’ll start keeping one container of each in my hallway cleaning cupboard. When I need to make a cleaner, I can grab my ingredients out of the cupboard take them to the kitchen or bathroom and refill my cleaners as needed. I’ll also plan to keep one container of the ingredients in the place that I use it most often. This is basically what I’m doing right now, but it makes it hard when I go to make my cleaners because I have to grab ingredients from all different parts of the house. For example, I keep a bottle of vinegar in the laundry area because I use it in place of fabric softener in the washing machine, and also for making my homemade stain remover spray. I keep a large box of baking soda in the kitchen which I use for baking, and also for cleaning the sink and stove top. Here is my cleaning cupboard “before”. I’ll share the “after” pictures with you next month! Keep your cleaners where you use them. Because you’re making your own cleaners, you can make as many of them as you need to use around the house. Make two bottles of multipurpose cleaner and keep one in your kitchen and one in your bathroom, along with a Parmesan cheese shaker of baking soda in each place as well. Keep one bottle of laundry stain spray in the laundry area and also in your kids’ room to spray stains before you throw clothes into the hamper. Keep your cleaning cloths and rags close to where you use them as well. I have one drawer in the kitchen dedicated to my kitchen cloth, as well as a basket for rags in my hall cupboard. Label your cleaners and include the recipe. It’s also important to label your homemade cleaners so that you know what’s in each container, especially when all your spray bottles look alike, like mine do. While you’re at it, put the recipe on the label as well so that you don’t have to look it up every time you need to refill the cleaner. This is one thing I really need to work on. My cleaners are not all well-labeled, and I definitely don’t have the recipes written out on them. So, as I’m cleaning out and organizing my cleaners this month I’ll also make sure I’m putting labels and recipes on all my containers. 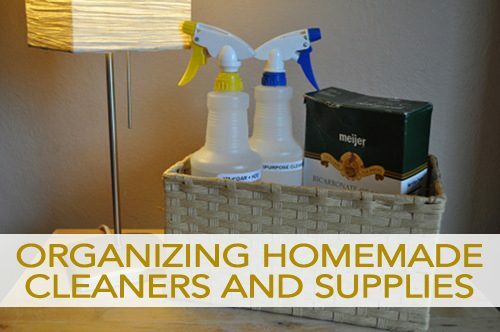 Those are some basic beginning steps you can take to organize your homemade cleaners and supplies. When you’re well organized, it may even make cleaning your home more enjoyable! Or then again, maybe not. Be sure to check back next month to see how I’ve organized, stored, and labeled my homemade cleaners and supplies! If you’d like to learn more about homemade and green cleaning, please join me on my blog, Live Renewed in October when I’ll be sharing 31 Days to Green Clean, covering a green cleaning topic every day for the whole month. You can subscribe to make sure you don’t miss a post! 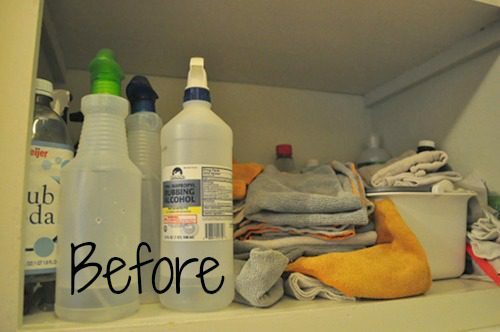 What’s your favorite tip for keeping your homemade cleaners and supplies well organized?